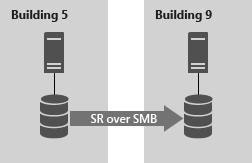 You can use Storage Replica to configure two servers to sync data so that each has an identical copy of the same volume. This topic provides some background of this server-to-server replication configuration, as well as how to set it up and manage the environment. To manage Storage Replica you can use Windows Admin Center or PowerShell. Here's an overview video of using Storage Replica in Windows Admin Center. Active Directory Domain Services forest (doesn't need to run Windows Server 2016). Two servers with Windows Server 2016 Datacenter Edition installed. A network between servers with enough bandwidth to contain your IO write workload and an average of =5ms round trip latency, for synchronous replication. Asynchronous replication doesn't have a latency recommendation. If you're replicating between on-premises servers and Azure VMs, you must create a network link between the on-premises servers and the Azure VMs. To do so, use Express Route, a Site-to-Site VPN gateway connection, or install VPN software in your Azure VMs to connect them with your on-premises network. In this scenario, each server should be in a different physical or logical site. Each server must be able to communicate with the other via a network. Many of these requirements can be determined by using the Test-SRTopology cmdlet. You get access to this tool if you install Storage Replica or the Storage Replica Management Tools features on at least one server. There is no need to configure Storage Replica to use this tool, only to install the cmdlet. More information is included in the steps below. Right now you can’t use Windows Admin Center on a server to manage Storage Replica. Two servers, named SR-SRV05 and SR-SRV06. A pair of logical "sites" that represent two different data centers, with one called Redmond and one called Bellevue. If you're using Windows Admin Center to manage Storage Replica, use the following steps to prep your PC to manage Storage Replica. Download and install Windows Admin Center. Download and install the Remote Server Administration Tools. If you're using Windows 10, version 1809 or later, install the "RSAT: Storage Replica Module for Windows PowerShell" from Features on Demand. Open a PowerShell session as administrator by selecting the Start button, typing PowerShell, right-clicking Windows PowerShell, and then selecting Run as administrator. Enter the following command to enable the WS-Management protocol on the local computer and set up the default configuration for remote management on the client. Type Y to enable WinRM services and enable WinRM Firewall Exception. Install Windows Server 2016 on both server nodes with an installation type of Windows Server 2016 Datacenter (Desktop Experience). Don't choose Standard Edition if it's available, as it doesn't contain Storage Replica. 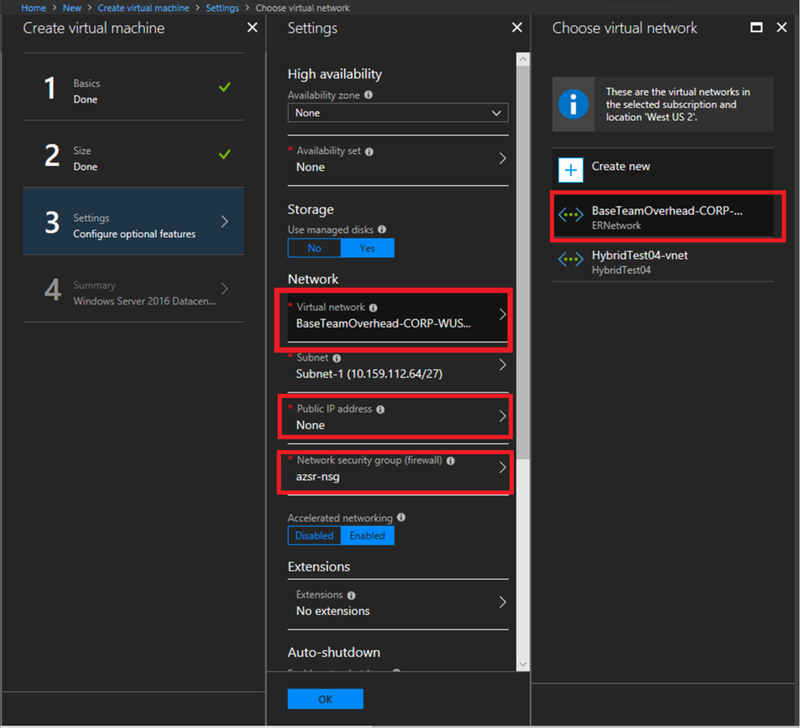 To use an Azure VM connected to your network via an ExpressRoute, see Adding an Azure VM connected to your network via ExpressRoute. Add network information, join the servers to the same domain as your Windows 10 management PC (if you're using one), and then restart the servers. From this point on, always logon as a domain user who is a member of the built-in administrator group on all servers. Always remember to elevate your PowerShell and CMD prompts going forward when running on a graphical server installation or on a Windows 10 computer. Connect the first set of JBOD storage enclosure, iSCSI target, FC SAN, or local fixed disk (DAS) storage to the server in site Redmond. Connect the second set of storage to the server in site Bellevue. As appropriate, install latest vendor storage and enclosure firmware and drivers, latest vendor HBA drivers, latest vendor BIOS/UEFI firmware, latest vendor network drivers, and latest motherboard chipset drivers on both nodes. Restart nodes as needed. Consult your hardware vendor documentation for configuring shared storage and networking hardware. Ensure that BIOS/UEFI settings for servers enable high performance, such as disabling C-State, setting QPI speed, enabling NUMA, and setting highest memory frequency. Ensure power management in Windows Server is set to High Performance. Restart as required. In Windows Admin Center, navigate to Server Manager, and then select one of the servers. Navigate to Roles & Features. Select Features > Storage Replica, and then click Install. Run ServerManager.exe and create a Server Group, adding all server nodes. Install the File Server and Storage Replica roles and features on each of the nodes and restart them. Ensure that each server can see that site's storage enclosures only and that the SAS connections are correctly configured. Provision the storage using Storage Spaces by following Steps 1-3 provided in the Deploy Storage Spaces on a Stand-Alone Server using Windows PowerShell or Server Manager. Ensure that each cluster can see that site's storage enclosures only. You should use more than one single network adapter if using iSCSI. Provision the storage using your vendor documentation. If using Windows-based iSCSI Targeting, consult iSCSI Target Block Storage, How To. Ensure that each cluster can see that site's storage enclosures only and that you have properly zoned the hosts. Provision the storage using your vendor documentation. Ensure the storage doesn't contain a system volume, page file, or dump files. Start Windows PowerShell and use the Test-SRTopology cmdlet to determine if you meet all the Storage Replica requirements. You can use the cmdlet in a requirements-only mode for a quick test as well as a long running performance evaluation mode. Examine the TestSrTopologyReport.html report shown in Figure 2 to ensure that you meet the Storage Replica requirements. Select New to create a new partnership. 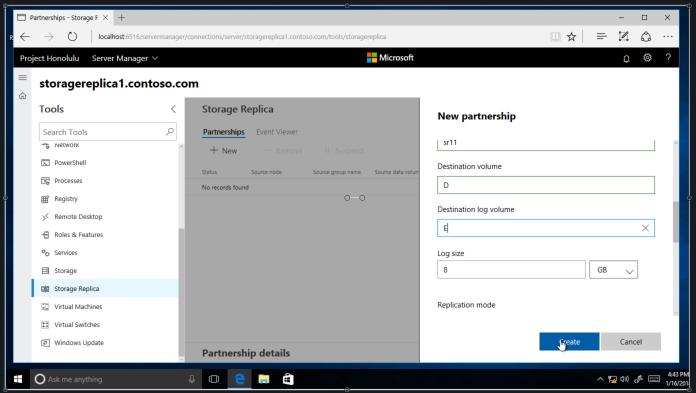 Removing the partnership from Storage Replica in Windows Admin Center doesn’t remove the replication group name. Now you will configure server-to-server replication using Windows PowerShell. You must perform all of the steps below on the nodes directly or from a remote management computer that contains the Windows Server 2016 RSAT management tools. Ensure you are using an elevated Powershell console as an administrator. Configure the server-to-server replication, specifying the source and destination disks, the source and destination logs, the source and destination nodes, and the log size. The default log size is 8GB. Depending on the results of the Test-SRTopology cmdlet, you may decide to use -LogSizeInBytes with a higher or lower value. Message      : Block copy completed for replica. Storage Replica dismounts the destination volumes and their drive letters or mount points. This is by design. On the destination server, run the following command and examine events 5009, 1237, 5001, 5015, 5005, and 2200 to understand the processing progress. There should be no warnings of errors in this sequence. There will be many 1237 events; these indicate progress. Now you will manage and operate your server-to-server replicated infrastructure. You can perform all of the steps below on the nodes directly or from a remote management computer that contains the Windows Server 2016 RSAT management tools. Use Get-SRPartnership and Get-SRGroup to determine the current source and destination of replication and their status. For more information on performance counters in Windows PowerShell, see Get-Counter. To move the replication direction from one site, use the Set-SRPartnership cmdlet. 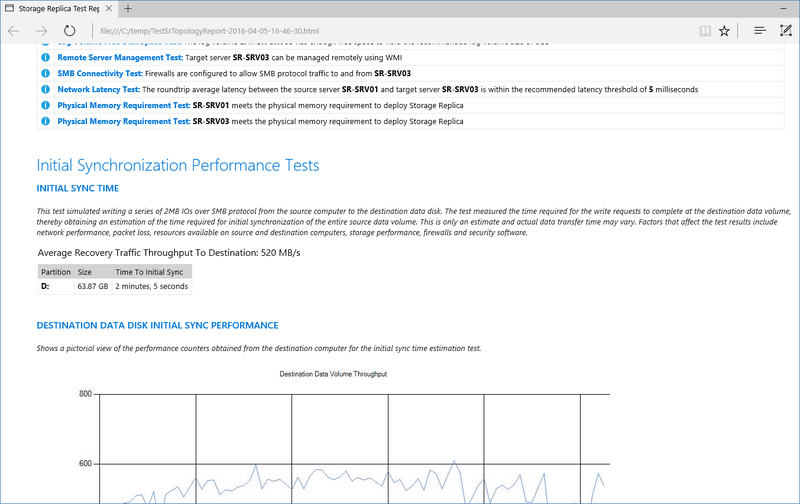 Windows Server 2016 prevents role switching when the initial sync is ongoing, as it can lead to data loss if you attempt to switch before allowing initial replication to complete. Don't force switch directions until the initial sync is complete. Check the event logs to see the direction of replication change and recovery mode occur, and then reconcile. Write IOs can then write to the storage owned by the new source server. Changing the replication direction will block write IOs on the previous source computer. It doesn't replicate in-use or open files. Its asynchronous replication latency can be many minutes, hours, or even days. It relies on a database that can require lengthy consistency checks after a power interruption. It's generally configured as multi-master, which allows changes to flow in both directions, possibly overwriting newer data. It only allows one-to-one replication between volumes. It's possible to replicate different volumes between multiple servers. While it supports asynchronous replication, it's not designed for low bandwidth, high latency networks. If these are not blocking factors, Storage Replica allows you to replace DFS Replication servers with this newer technology. Install Windows Server 2016 on two servers and configure your storage. This could mean upgrading an existing set of servers or cleanly installing. Ensure that any data you want to replicate exists on one or more data volumes and not on the C: drive. a. You can also seed the data on the other server to save time, using a backup or file copies, as well as use thin provisioned storage. Making the metadata-like security match perfectly is unnecessary, unlike DFS Replication. Share the data on your source server and make it accessible through a DFS namespace. This is important, to ensure that users can still access it if the server name changes to one in a disaster site. b. Don't add the destination server to the DFS Namespaces namespace, or if you do, ensure that all its folder targets are disabled. Enable Storage Replica replication and complete initial sync. Replication can be either synchronous or asynchronous. a. However, synchronous is recommended in order to guarantee IO data consistency on the destination server. b. We strongly recommend enabling Volume Shadow Copies and periodically taking snapshots with VSSADMIN or your other tools of choice. This will guarantee applications flush their data files to disk consistently. In the event of a disaster, you can recover files from snapshots on the destination server that might have been partially replicated asynchronously. Snapshots replicate along with files. Operate normally until there is a disaster. Switch the destination server to be the new source, which surfaces its replicated volumes to users. If using synchronous replication, no data restore will be necessary unless the user was using an application that was writing data without transaction protection (this is irrespective of replication) during loss of the source server. If using asynchronous replication, the need for a VSS snapshot mount is higher but consider using VSS in all circumstances for application consistent snapshots. Add the server and its shares as a DFS Namespaces folder target. Users can then access their data. Disaster Recovery planning is a complex subject and requires great attention to detail. Creation of runbooks and the performance of annual live failover drills is highly recommended. When an actual disaster strikes, chaos will rule and experienced personnel may be unavailable. Create an ExpressRoute in the Azure portal. After the ExpressRoute is approved, a resource group is added to the subscription - navigate to Resource groups to view this new group. Take note of the virtual network name. Add a network security group. When creating it, select the subscription ID associated with the ExpressRoute you created, and select the resource group you just created as well. Add any inbound and outbound security rules you need to the network security group. For example, you might want to allow Remote Desktop access to the VM. Virtual network: Select the virtual network you took note of from the resource group added with the ExpressRoute. After the VM is created, see Step 2: Provision operating system, features, roles, storage, and network.